Watch young Magpie defender Jonathon Marsh discuss Collingwood's 44-point loss to Footscray at Victoria Park on Sunday. Magpie Defender Jonathon Marsh talks about Collingwood's loss to the Footscray Bulldogs. 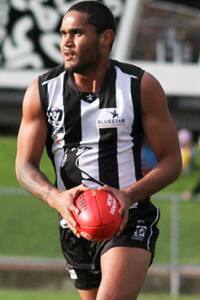 Peter Yagmoor rebounds from half back during Collingwood's loss to Footscray at Victoria Park on Sunday. Photo: Shane Barrie. Collingwood suffered its second loss in as many weeks when it fell to Footscray at Victoria Park on Sunday. The Bulldogs held sway all afternoon, recording a 45-point victory in a physical encounter at the Magpies' spiritual home. Dale Tapping's Magpies were on the back foot after conceding six goals to two in the opening term but closed the gap to just 16 points at the main break. Unfortunately the Bulldogs had the better of the second half, outscoring the Pies with a 10-goal second half. Collingwood's task was made even harder by the absence of several senior listed players, meaning it fielded just eight players from its AFL list. “We always knew it was going to be a tough day considering they had a lot of AFL representation and the fact that our list wasn’t as strong with AFL representation, but in the contest we were beaten,” Development Coach Anthony Rocca told collingwoodfc.com.au. “They were just a little bit cleaner than us through the contest and they kicked a few goals on us early and they exposed our defence, particularly deep with some of their experienced players in one-on-one contests. That really hurt us. “The second quarter was heaps better. If we didn’t win the clearances, we evened it up, and we were a whole lot cleaner through the middle and provided opportunities for our forwards and it became a real contest. Eight days earlier, the Magpies had been thoroughly beaten by Sandringham – and not just in general play. The Zebras tested the Pies physically and triggered a change in attitude in the Collingwood camp. “We were exposed in that area last week,” Rocca said. “We were very reactive and the whole week was about teamsmanship and supporting our teammates. If one of our teammates was dumped or put on his backside, we were able to support and give a little bit back. On a day dominated by the tricolours, rover Ben Kennedy never stopped running and constantly sought to break the game open, while VFL-listed pair Jake Williams and Nick Riddle could leave the ground with their heads held high. “Ben Kennedy played well. He’s consistently playing well. We’d like him to use the ball a little bit better but he’s consistently in and under and driving through packs. “I thought Nick Riddle, particularly after quarter time, read the play when it was coming into the backline. He did really well after quarter time. “Jake Williams was lively and presents as a hard small forward and I reckon when we get a few AFL guys back, his ability to create will increase. As with any football club, things move on quickly. The focus has turned to Saturday’s trip to Morwell to face Richmond and the imminent returns of two key forwards. “We play Richmond in Morwell next week and we’ve got to get back on the winners list. That’s two in a row now that we’ve dropped and I’m pretty sure we’ll get a bit of AFL experience back next week, such as Patrick Karnezis and Corey Gault.